Pickering would seem an unlikely place to find the grave of a man known as the Father of the Chinese Methodist Church, but Reverend George Piercy was no ordinary man. 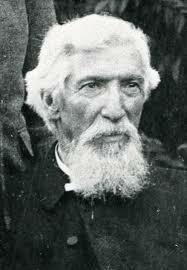 George was born in 1829 on a farm near Levisham, the sixth of seven children of John and Hannah Piercy. Unlike his two brothers, George preferred reading to farm work and after a trip to Whitby the twelve year old joined the Merchant Navy and worked on a sailing barque around the Mediterranean, scrubbing decks and carrying out other menial work. Coming back home nearly three years later, George found himself drawn to Methodist preachers giving sermons on the Castle Green in Pickering, and realised that God had chosen him to do the same. He became a noted preacher and met his first wife, Jane, when his ministry took him to her home village of Nunnington, where her father was steward of Nunnington Hall. The Hall is now owned by the National Trust and well worth a visit. Yet George was not content to preach in Yorkshire, or even England. Instead he fixed his sights on China, a country just beginning to open up to the West and where spreading the word of Christianity had, until very recently, been punishable by death. So in 1850 George set out on the four month voyage to Hong Kong, learning Cantonese from the captain’s boy. He had no mission to travel to: only a letter of introduction in his pocket and £100 he had borrowed from his father. Once in China, George set himself the task of learning Canotonese well enough to preach and translate, and once Jane had joined him they set to work on setting up schools and bringing Methodism to the people of China. Jane’s work also brought education to women for the first time. China was still a dangerous place for missionaries, and several of George’s fellow clergymen lost their lives. After 31 years in China, and having lost his beloved Jane and their baby daughter there, George returned to England in 1882, and remarried. His work continued and he founded a mission in London’s East End for Chinese seamen, many of whom were addicted to opium. At the age of 81 George finally retired, and died a few years later in 1913. He was buried in the graveyard of the Methodist Chapel on Hungate in Pickering. That building was later sold and his grave is now on private land, but his headstone can be visited in the graveyard of St Peter and St Paul’s Church in Pickering. In 2013, George’s great-grandaughter, Jane Ashby, unveiled a memorial to Reverend Piercy at Beck Isle Museum in Pickering, and wrote a book detailing his remarkable life. We are always delighted to welcome visitors interested in learning more about the local man who brought Methodism to China, and Jane’s book is available in our gift shop or by mail order. Yorkshire has given the world many famous sailors – George Piercy’s story is one of the most surprising.